VVPAT slips should be matched with the EVM count in 14 booths per assembly constituency. The Supreme Court’s intervention in the EVM-VVPAT debate opens up a golden opportunity to set the matter to rest, just in time for one of the most critical Lok Sabha elections in the history of independent India. All we need now is the Election Commission to budge from its pointlessly stubborn position in the apex court. I have been arguing for some time that the EVM debate is unnecessary and harmful. I had suggested that instead of junking EVMs, we should tweak the existing procedures to bring greater transparency and enhance public confidence. In this spirit, I had made five suggestions. One, the EVMs should be open to checking by political parties before these are deployed. Two, EVMs should be assigned randomly to different constituencies in the presence of political parties. Three, voters should be allowed to register an objection if the paper slips do not match the party they voted for. Four, the malfunctioning EVMs should be replaced within 30 minutes. And five, VVPAT slips should be matched with the EVM count in 14 booths per assembly constituency. To my pleasant surprise, I received a response from Secretary, Election Commission (EC) that the first three of my suggestions are actually part of the electoral rules and are being followed. There is an established protocol of first-level checking of every EVM in the presence of political party representatives. There is also a set procedure for two-stage randomisation of EVMs, which takes place in the presence of representatives of parties and candidates. There exists an enabling provision (Rule 49 MA of Conduct of Election Rules, 1961), which I did not know about, that allows a voter to object if he or she suspects a mismatch between the paper slip and the party he or she voted. In that case, the presiding officer of the polling booth can order a special ‘test vote’ to be cast. If it shows a mismatch, polling stops in that booth. I also received detailed and very helpful feedback from a serving civil servant that clarified many of my doubts. That leaves us with only one real issue: the number of EVMs to be matched with the VVPAT slips and the process of the VVPAT audit. ‘VVPAT audit’ needs explanation. 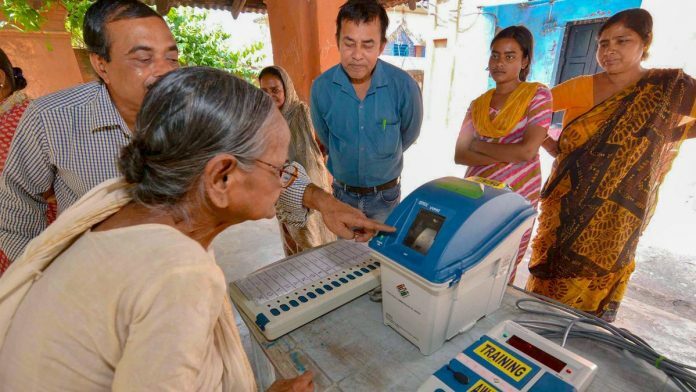 With the introduction of the voter-verified paper audit trail (VVPAT) machines, now there are two independent ways through which votes can be counted for each booth. There is the EVM’s display board that shows, at the press of a button, the number of votes secured by each candidate. And now, there are paper slips produced by the VVPAT machine that go inside a sealed box, which can be opened and the slips can be physically counted. The whole point of introducing VVPAT machines was to generate greater confidence among voters, candidates and political parties. Thus, the EVM could now be subjected to ‘VVPAT audit’: matching votes secured by each candidate in the EVM display with the physical counting of the paper slips. However, under the existing provision, this verification is for all practical purposes left to the courts. The EC mandates (Rule 16.6) that at the end of the counting, the VVPAT audit should be done in only one randomly selected booth in each constituency. There is also a rule (16.5) that after the counting, but before the declaration of result, any candidate can request for a VVPAT audit in any or all polling stations. But the decision is left to the discretion of the returning officer. Otherwise, the candidate has to approach the courts. So, the number of booths and the process of VVPAT audit are now the heart of the matter. The last couple of months have seen positive developments from all sides. The opposition has given up on its earlier cynicism about EVMs and the demand for a return to the paper ballot. The petition by virtually all the leading opposition parties to the Supreme Court now reflects the same understanding. They have demanded verification or audit of VVPATs in 50 per cent booths in each constituency. A group of retired civil servants also wrote a very sensible petition that underlined the heart of the matter: the issue is not EVM versus paper ballot, the real issue is VVPAT without sufficient audit versus VVPAT with adequate audit. The EC took a stubborn position in the Supreme Court that VVPAT audit of just one booth per constituency is enough. Apparently, the Supreme Court bench was not pleased and has asked the EC to propose a higher number of VVPAT audits in an affidavit by 28 March. The case comes up before the court on 1 April. Also read: EVM hacking allegations: Politically malicious or should they be investigated? To my mind, the current controversy can easily be resolved. The Election Commission’s insistence that VVPAT audit in just one polling booth per constituency is sufficient makes the audit look perfunctory and suspicious. The EC seems to be drawing upon an expert report given by a committee of reputed statisticians, which seems to have recommended VVPAT audit in only 479 randomly selected booths throughout the country. The statisticians were not wrong. Such a small random sample is adequate to assess the overall reliability of the EVM count for the country as a whole. But that is not the operative question. The point is to verify the system for each constituency and to do it in a way that not only meets statistical standards of proof but also generates public confidence. The EC’s proposal doesn’t do either of these. On the other hand, the opposition’s demand for 50 per cent audit is unnecessary and very cumbersome. You don’t need a sample of 50 per cent for any verification. Statisticians tell us that one need not think of sample in terms of percentage of the total number of booths. What matters is the actual number of sampled booths, not the percentage. So, let me repeat my earlier suggestion that meets both the requirements. One, VVPAT audit should be done in 14 booths per assembly constituency (or assembly segments within a parliamentary constituency). There is nothing statistical or magical about the figure 14. It so happens that each round of counting is done on 14 tables (for reasons I have never understood) in each assembly segment. Two, this audit should be done at the beginning of counting, not at the end. One randomly selected EVM and its respective VVPAT should be opened and matched on each of the 14 tables before rest of the EVMs are counted. If these match, the rest of the counting should take place as it does now. If not, then paper slips should be counted for all the booths in the entire constituency. Three, once the counting is over, each candidate should have a right (not left to the discretion of the returning officer) to demand VVPAT audit in at least one booth of his or her choice. Once again, in case of a mismatch, paper slips should be counted for the entire constituency. Let us hope the EC or the SC would settle this matter once and for all. I really hope this is my last article on an issue that should have been sorted out long ago. Rubbish fit for waste basket. Article is rubbish and be thrown into waste basket. Why not ask for VVPAT in all EVMs? Why is it so hard for “election specialists” ( not psephologists) like yogendra yadav, (who also joined a party and then got removed from it) to simply accept that their poll math regarding modi/Yogi was horribly wrong and to put the blame on something other than their own analysis, they all conveniently chose the poor EVMs, who could not defend itself from the barrage of assaults. After all BJP has lost elections done by EVM, but somehow all hue and cry comes only when BJP wins against their expectations.